So here’s the good-news / bad-news situation. Which should — by this point — sound like a pretty familiar situation to folks reading along at home. The bad news is that once again, for the third year out of the last five, I’m not hosting Thanksgiving. I used to insist that Thanksgiving was my holiday. I used to beg, plead, and cajole family and friends to schlep out to Philadelphia from California, or Missouri, or wherever else to come eat turkey and dressing, pie, bread, and even curry — whether they wanted to or not. I insisted that you simply must make an appearance! It’s Sarah’s and my anniversary, and we would be terribly offended if you stayed away. And then I had a grand old time cooking like a crazy person and sometimes confounding Thanksgiving expectations. 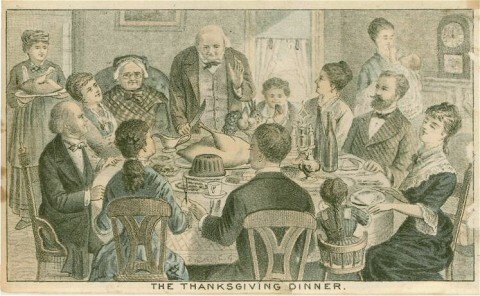 An artistic rendering of my ordinary Thanksgiving festivities. Via Wikimedia Commons. But now, I can feel my Thanksgiving cred draining away. The folks who used to flock across state lines to eat my duck-broth cream of mushroom soup have decided that they’d rather get their fowl somewhat closer to home. A couple of years ago, Sarah and I ate our meal out. In a restaurant. Just the two of us. * And now I can’t even claim sole ownership of a Thanksgiving anniversary. Elizabeth got hitched this time last year, and she now has at least as strong a claim to the we’d be terribly offended argument as I have. So here we are — a Thanksgiving-less house, this year. That’s the bad news. But — as I’ve maybe suggested — every silver cloud is lined with something. And here is the lining this year: because I don’t have to worry about getting a whole Thanksgiving meal prepared, all on one day at the end of the month, I have the opportunity to stretch it out, make it last, and blog about it. Last year, November saw a turkey-day turkey and a vegan pumpkin soup, both pumped out early enough that you — dear readers! — could use the recipes in your own Thanksgiving prep (if you so wished). And this year, here I am again, doing the same. Which brings me to this weeks’ experiment: roasted squash with sage and bacon. This dish is not exactly traditional turkey-day cuisine. But that is only true insofar as it’s probably not something you saw on your auntie’s table when you were a kid picking marshmallows off the top of the sweet potatoes. In its form, its ingredients, its — its holiday spirit — this roasted squash will fit right in. After all, it’s fitted out with all the things you want in a Thanksgiving side dish. It mixes sweet and savory. It has lots of sage. 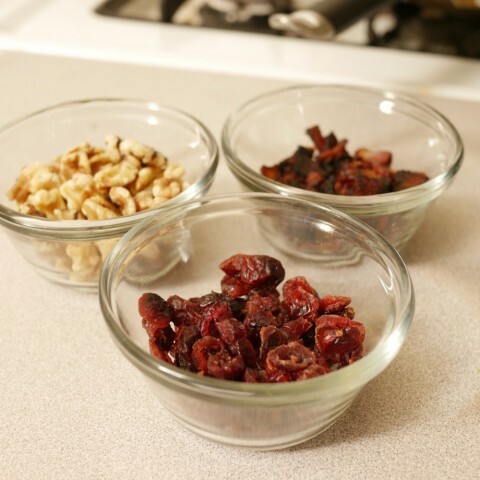 It has dried cranberries — which are Thanksgiving gold, people! And above all, it’s orange. In terms of the structure of a holiday meal, this dish might take the place of your childhood yam casserole (assuming that nostalgia and marshmallows don’t weaken your resolve). Or it might quietly displace that plate of limp glazed carrots that nobody was going to eat, anyway. What roasted squash with sage and bacon gives you is the right combination of harvest tastes, combined with the delicious savor of having something slightly new — slightly innovative — at your holiday table. It’s pretty. It’s highly edible. And I really think you should give it a try. 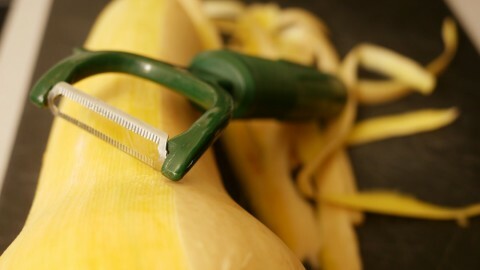 Peel and seed the butternut squash, and cut it into one-inch cubes. Toss the cubes with the sage, thyme, olive oil, salt, and a generous quantity of pepper. 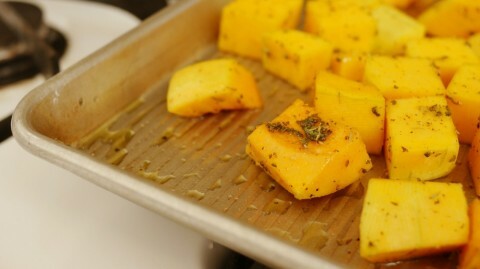 Then spread on a baking sheet and cook for about an hour (or until the cubes are fork tender). 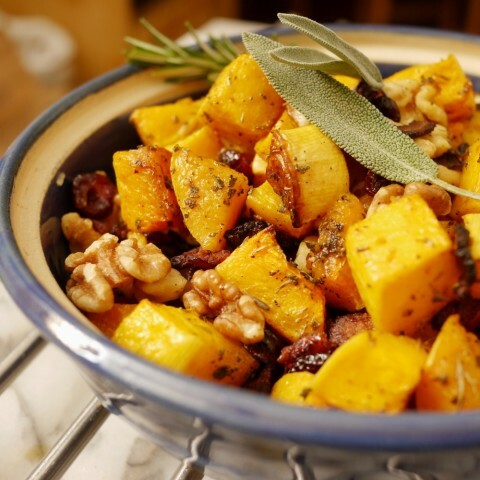 While the squash is roasting, lightly toast your walnuts. 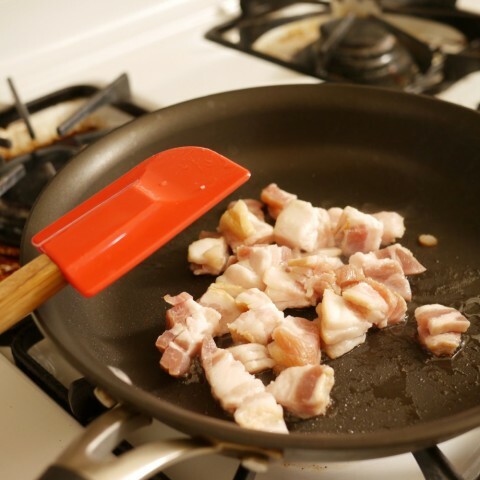 Cut the raw bacon into bits, and fry until crisp. Reserve the rendered fat for some other project (like rubbing into your turkey), and set the bacon itself aside. 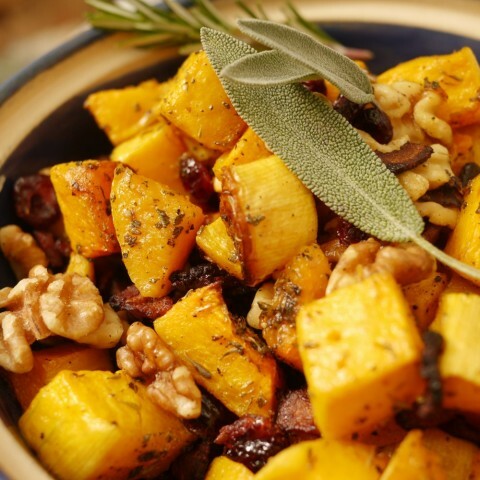 When the squash is cooked, combine it in a medium mixing bowl with the bacon, walnuts, and cranberries. Toss gently but thoroughly. Add additional salt to taste, and serve hot. This recipe scales easily, and could be doubled, or even tripled, for your ultra-massive Thanksgiving feast. * To be fair, we were away in Washington D.C., and the restaurant was José Andrés’ brilliant Cafe Atlantico. Yum! (Minus the bacon, for vegetarians) 🙂 I did a homemade pizza with roasted butternut squash, sage and goat cheese that turned out great too.